It has been a great start to the year for Hive wars. We have recently reunited and decided to give the game an overhaul from the scripting to the graphics. This Update has been long overdue but finally we have something to show. This year will hopefully be the year that we raise money to finally put in some real production. Starting this month we are working real hard to get a working demo out to the public. The Bulgarian has been working around the clock implementing new features, tweaks and many bug fixes. We are currently sitting at build 78, though not ready for the public many things have been reworked. Our first milestone for 2016 is to have a working public demo mid April. 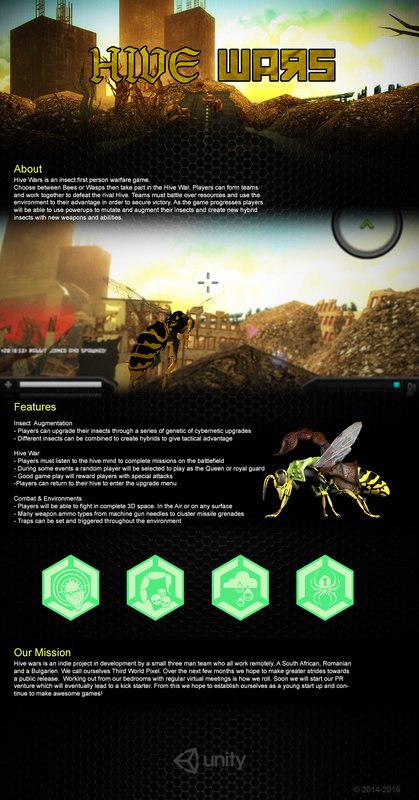 These Bees have greater range when it comes to targeting, have the ability to take down multiple targets at once, increased speed makes them a difficult target. Coupled with light but rapid firing weapons, these guys usually spearhead assaults on enemy Hives. These guys are as tough as they are mean. Superior to the bee in every way these guys pack added punches in the form of high powered needle cannons that can destroy some targets in one hit armed with a heavy cannon there is very little armor can do to save you. Genetically modified with DNA from other arthropods these insects provide a series of unique support rolls. Using spider like attacks they can set up ambushes or provide a unique counter attack which disables their pray leaving them vulnerable to attack. Not as fast at the Techno counterparts but don't let that fool you, their venom is highly toxic. Slow but heavily armed, not much can get through their heavy armor, but getting in close will cause you a world of hurt. Equipped with various methods of destruction from spitting acid to could of poison these guys are toxic bombs from hell. This concludes this months update, next week we will have more news on the current build and will keep the community up to date on our development. If you like what you see, or have any suggestions please leave feed back or send us a mail. 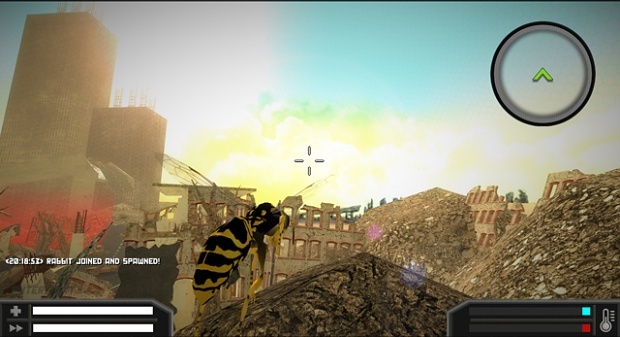 Improved Camera delay, Insects now look and move more realistically, creating a better immersion for our 3rd person insect shooter. A list of our most recent updates and what awaits Hive Wars over the next few months in 2015, programmer desperately needed. Introducing the Hazmat suit science team. This is the prelude narrative to the main stage in Hive Wars. No spoilers given. Enjoy. This looks like a interesting game, I will definitely get it.